First In Last Out: The surveyor acts as maestro in getting a coal mine up and running. This is the first in a three-part series about the role surveyors play in the production of coal, from a mine’s inception to the mining itself to when the land is reclaimed for other uses. A coal furnace used to be standard issue in a home, the large metal monster in the basement constantly needing to be fed and the ashes hauled away. You may notice small doors labeled with the word “coal” on the foundations of old homes—the doors would swing open for deliveries down a chute into the basement. Times have changed with natural gas, oil, and solar now heating homes, but there’s no doubt coal still has a future, according to R. Larry Grayson, professor of energy and mineral engineering at Penn State University. He said, “Fifty percent of our electrical power comes from plants that in large part are coal-powered,” and his observations have been reflected by the U.S. Energy Information Administration that predicts coal consumption in this country will increase at about 1.1% per year through 2035. That’s going to mean expanding already existing mines and finding new ones, a job that relies heavily on surveyors who are known as being “the first in and the last out” when it comes to coal mine production. E. Franklin Hart, PS, PE, of Bluefield State College in West Virginia and Jimmy Corner, PS (SU), PE, of True Line, Inc. in Thorpe, West Virginia, explained that much of the responsibility of the mine surveyor begins with conventional surveying, but with a greater emphasis on the three-dimensional environment and the health and safety of the miners. It becomes important to receive much of the same training as a miner, to learn the tasks of a foreman, to participate on the local mine rescue team, and to team with others. “The mine surveyor teams with owners, investors, managers, engineers, economists, land surveyors, geologists, soil scientists, biologists, lawyers, accountants, and miners. These professionals work closely together in the life of a mine. How well they team is important because of the constantly changing parameters in this multidisciplinary field,” Hart said. Coal is the most abundant fossil fuel produced in the United States. Grayson said 65% of the country’s mines are on the surface, with Wyoming having the bulk of those operations. Nearly one in six Wyoming workers are directly or indirectly employed in coal development, according to the Bureau of Land Management. The rest of the coal supply comes from underground mines, mainly in the heart of the Appalachian Mountains. West Virginia is the top producer of deep coal, followed by Kentucky and Pennsylvania. Marshall Robinson, owner of Allegheny Surveys, Birch River, West Virginia, has been in the business for 23 years, with about a quarter of his firm’s work in coal mining. When a mine is conceived, a geologist or mining engineer will first drill holes to the coal seam “and do a test on the height, density, and BTUs to make sure it will be worthwhile” to proceed, he said. That’s when surveyors enter the project. This stage of the mine planning process also includes production forecasting, facility site planning and projections, and volumetric work and pit sequencing. Mapping of adjacent workings also plays a critical part in overall safety. Grayson said the next step—the permitting process—“is more stringent than it used to be” with considerations ranging from the environmental impact to whether the area has archeological value to whether existing utilities will be affected. For example, “three different permits are needed to satisfy the Clean Water Act—the EPA has a lot to say.” Additionally, requirements must be met pertaining to the Endangered Species Act, the Resource Conservation and Recovery Act that controls hazardous wastes, and the Clean Air Act, according to the American Coal Foundation. Robinson said, “West Virginia is the only state I know of that has a separate test for underground surveying.” He formerly served on the West Virginia board of registration, and at that time they established both a written and oral test for candidates. Rankin, who has a staff of four to five surveyors, three biologists (who monitor stream samples), and an engineer, said engineers are more qualified to determine the profitability of a site, but surveyors “figure how much earth needs to be removed to get to the coal” in a surface mine. Rankin said surface mining is where he does most of his work. Once the permits have been obtained, “surveyors will mark to show the first direction to go,” Robinson said, naturally starting with the mine’s entrance. Rankin’s description of this stage is rather poetic. “I think of a surveyor as a maestro leading the orchestra” of getting a mine up and running. In West Virginia, because of the rugged terrain and dense foliage of the mountains, RTK surveying “is useful, but limited,” he said. His company owns five RTK units that they use in locating drillholes, various boundary limits, and other surface features where they can, and they also use mapping-grade GPS, post processed, often when determining the outcrop of the coal seam in the woods. The tunnels from the entry run parallel to each other and are used for the miners, equipment, and air, as well as to bring out the coal. Elevators that drop hundreds of feet are used to transport men and materials to the coal seam being mined. They are placed in large shafts that also provide primary or supplemental ventilation for the mine. Just as important as what’s under miners’ feet are conditions found in broad daylight. Robinson said that’s especially true if you’re going to be mining under a lake impounded by a dam, for example. “Obviously you have to stay a certain distance away” so that the dam structure isn’t compromised. “We’re mining under houses, under water wells ... Unfortunately, some people do lose their water wells on occasion, and the coal company will come in and drill a new well. They sometimes participate financially in helping to provide city water to remote areas that they have mined under. This scenario is in the planning stages for a water system within a few miles of where I live. Once the mine entry is established, surveyors “are the ones from that point on who guide the miners and give their equipment direction. It’s not rocket science, but there’s a real knack to doing it. 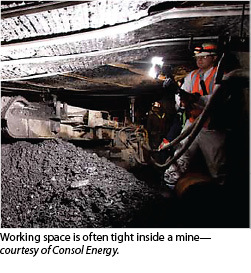 Next in this series is a look inside the mine: how surveyors are crucial to coal production as well as on the frontline in the case of an accident when miners need to be rescued.